I have heard about the gloves-in-the-breast-pocket look but I have rarely seen it done successfully. This version, I think, is very well done. 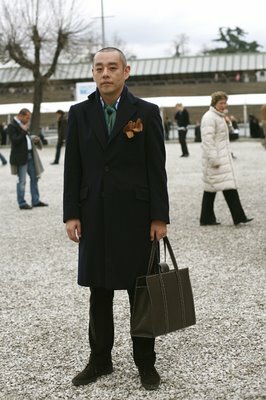 Comments on "At Pitti Uomo...Gloves in the Chest Pocket"
One of the reasons that the gloves-in-pocket thing is well done here--or is, at least, saved from self-consciousness--is that their color harmonizes so nicely with both the coat and the "foulard." In fact, the whole outfit is successful, with keen regard to proportion (even the bag's "length" is right). I have started putting my hat (it's a skullcap) in the breast pocket of my sport coats. Since winter has been so warm I've mostly been wearing sport coats over sweaters rather than full winter gear but being bald I always need a hat. I've gotten lots of compliments on this little flair. My point is that I'm prejudiced on the side of the gloves in the pocket as it's a nice change. I find it very difficult to understand men's fashion, but I think I'm learning from you. proportion is definitely the key to pulling off the look...you need to have the right amount of glove sticking out of the pocket. The gloves in the photo, taken as an abstract smattering of colour and shape, are quite attractive in the coat pocket. However, I can't quite get my head around gloves in breast pocket. If it's cold outside and you have your overcoat on, it suggests that it's probably cold enough to have your gloves on as well, no? The chest pocket is a good place for gloves. If you stuff them in your pockets it adds bulk around your waist or hip, ruins the line of the coat and adds 10 pounds to the picture. I totally agree with this being well done, I like the peeping gloves...nice! I like it because it looks as if the breast pocket was the first place that crossed his mind as a receptacle for his gloves. I like how confident and relaxed he seems...kinda like those gloves...relaxed, worn and comfortable in their home. What are those rubber soled shoes? They're from England, I believe, but I can't recall the classic brand. I feel like there is too much going on with the accessories and not enough going on with the coat. 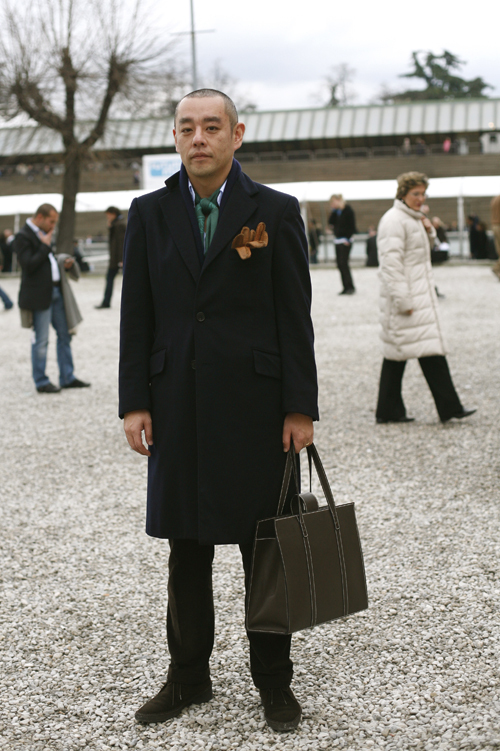 I say if you are going to go all out with accessories, somehow match it in "weight" with the oomph of the coat. In other words, the coat is so conservative that I feel it is inconsistant with the rest of his outfit. That being said, he looks clean and lintless and wrinkleless as can be, which is admirable, since I can never seem to accomplish all three things at once! The closely cropped "do" seems to add to the immaculate effect. I like the shot of colour in the green scarf. There's not enough green in the world, methinks. Btw, those images on Style.com are AMAZING - what beautiful, stylish men! It's a real pleasure to see them. Anonymous 1: The skullcap in the pocket is nice idea, but most would be too bulky. I would like to find one in a fine knit. I would be grateful if you would reveal your source. Thanks. I love it! the color and the knotted scarf is so great! and the gloves in pocket very fun! I also love the flash of green at his throat. Your eye seeks details and that is the beauty of your blog! Can anyone identify the make of his shoes/boots - similar to Campers of a few years ago but without the Moc toe. He looks so nice, but why the poor posture? If he were standing up straight, he look a million times better.